Picture yourself in a brand new, sporty and versatile sedan that has been redesigned from the group up… Now, let's make that a reality at Honda of Murfreesboro of Murfreesboro, TN! We have all the brand- Honda Accord models that are ready for you to take it for a spin! There's no better place than to get into your new car than at Honda of Murfreesboro. We aim to make your car-buying experience easy, fun, and absolutely hassle-free and thrive on finding you the Honda that perfectly fits your needs and desires. At Honda of Murfreesboro, TN, we proudly serve the Nashville, Shelbyville, Franklin, TN, and surrounding areas, and are located conveniently at 1625 S Church St, Murfreesboro, TN 37130. Hurry in, so we can take you on the test drive of your life in your next car! The all- Honda Accord's i-VTEC V-6 Engine is designed and ready to take you everywhere you need to go, surpass the competition, and ensure a seamless and enjoyable driving experience. It comes equipped with Continuously Variable Transmission (CVT) that works to create a smooth ride by optimizing gear shifts; allowing you to accelerate quickly and smoothly, and the Honda Accord's fuel efficiency soars. Such power doesn't come at the sacrifice of fuel-efficiency, as the 2016 Honda Accord produces an EPA-Estimated 27 mpg city and 37 mpg highway. If you want to ensure even more fuel efficiency out of your Honda Accord, just press the ECO Assist button! This allows you to optimize your fuel-consuming systems, in order to maximize your mpg, and keep you on the road longer. Honda represents some of the most cutting-edge safety technology and provides its drivers to travel with peace of mind. The 2016 Honda Accord was designed with an advanced compatibility engineering body structure works to mitigate some of the forces caused during a collision, by distributing crash energy throughout the front end of the vehicle. The Tire Pressure Monitoring System alerts you of when your tires may be compromised and reaching less than optimal inflation levels. The Multi-Angle Rearview Camera allows you to increase road awareness with a 360 view, making those blind spots entirely visible, giving you the confidence to make turns and switch lanes. 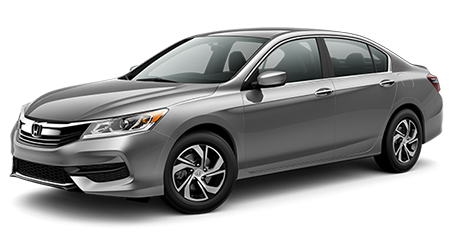 Each Honda Accord comes equipped with Dual-stage, multiple-threshold front airbags; select models utilize SmartVent front side airbags and side curtain airbags with rollover sensors, to further protect you in the event of a collision. The Lane Departure Warning and Road Departure Mitigation features work to alert you when you are veering off your safe zone, keeping you and your loved ones safe and sound. So, what are you waiting for? If you're ready to make a positive change in your life, come on in and visit us. The all- Honda Accord is here and waiting for you to give it a spin! At Honda of Murfreesboro, TN, we look forward to the opportunity to work with you and your family in finding the car that best fits your needs and driving style. We are conveniently located at 1625 S Church St, Murfreesboro, TN 37130, and proudly serve the Nashville, Shelbyville, Franklin, and surrounding TN areas. We're ready to serve you today, so stop on by and let's set you up for a test drive of the all- Honda Accord, today!